The Paria Plateau is the central geographic feature of Vermillion Cliffs National Monument; a remote, sandy area 20 by 20 miles in size bordered by Buckskin Gulch and the Paria River to the north, the cliffs themselves to the east and south, and House Rock Valley to the west. Some parts are flat, others gently sloping, and the area is crossed only by rough tracks, most requiring a 4WD vehicle due to long stretches of deep, soft sand. Dotted across this generally featureless region are numerous small outcrops of the underlying Navajo sandstone, eroded to form unusually varied shapes, generally colored white or red but mixed with layers of many other shades. The largest and best known formations are the Coyote Buttes, in the northwest corner of the plateau, including the famous Wave, while the second most visited site is six miles southeast - this is White Pocket, a group of domes and ridges covering an area of one square mile, below a larger mesa lined by similar rocks. A pocket, in this sense, refers to a relatively small area of land markedly different to its surroundings, which here, like most of the plateau, are sandy plains sparsely covered by bushes and small trees. 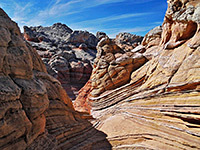 White, or light grey is the dominant rock color, in contrast to the red of the Coyote Buttes, but the general features are similar - swirling, thin-layered strata, adjacent layers of contrasting color, and curious erosive features. Other colorful pockets are found further south and east on the plateau, some also with an official name but most unrecognized. There are several dozen locations, all with the potential to have photogenic formations. 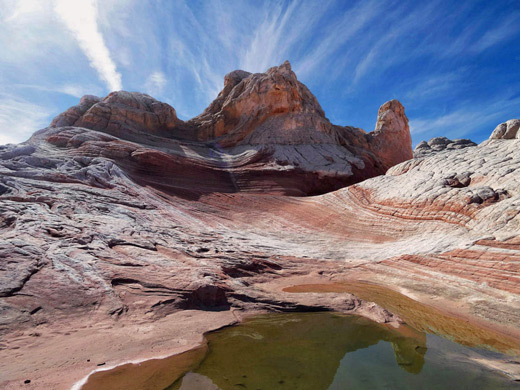 Like Coyote Buttes, some formations at the White Pockets are delicate and could be damaged if subject to a large number of hikers, but there is no permit system and visitation is unlimited; it is however naturally restricted due to the difficulty of access. The main approach to the Paria Plateau is along House Rock Valley Road to the west (see map below); an unpaved route generally suitable for regular vehicles except after heavy rain. 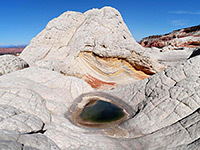 The usual turn-off for White Pocket is 16.4 miles south of US 89 (13.3 miles north of US 89A) at Lone Tree Reservoir. From here, a track heads southeast then northeast, past Paw Hole (2.6 miles) to a junction at Poverty Flat (5.7 miles), then on to another intersection at an old ranch site (7.6 miles), further east to a third junction (10.4 miles) and finally north to a parking area beside a fence on the east side of the pocket. There are several difficult, sandy places before and after Poverty Flat, though this place may be reached by an alternative route, free of the deep sand; this involves driving 3.8 miles further south along House Rock Valley then east, across Corral Valley, turning north at the first major junction, past the generally uninteresting Red Pocket (6.2 miles) and on to the flat (15 miles). The first sandy section is a mile or so further, but non-4WD visitors are now within hiking distance of White Pocket, around 3 miles along the track or 2 miles partly cross country. Very determined hikers could reach the place via a strenuous hike of about 8 miles, starting directly from House Rock Valley, while another option is to take an all-day guided tour, which in 2017 costs $175 per person. The roads to Poverty Flat also form part of the route to the Cottonwood Cove region of South Coyote Buttes. The closest formations to the end of the road are 1,000 feet west, part of a broad, low relief ridge of white sandstone which to the north approaches taller white cliffs at the edge of a mesa and to the south breaks up to a series of little domes and outcrops of 'brain rocks' - curving surfaces split by deep cracks into irregular polygonal shapes. The ridge has various gullies, wave-like formations and potholes that retain water for a long time after rain. 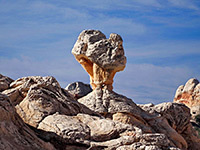 A quarter of a mile west is a smaller but higher white hill, the actual White Pocket, with similar forms and features, centered on a thin ridge rising up to 450 feet above the surroundings. All the major features in both sites can be seen in a couple of hours, walking between 2 and 3 miles, but as usual with this kind of intricate landscape, much more time can be spent looking into all the little ravines and crevices, and waiting for the best light conditions.